Artist Jewelry by Chris Steenbergen engagement ring gold onyx brilliant Art Deco: Description by Adin Antique Jewelry. With this 14K white gold ring in Art Deco style by the well-known Dutch jewellery artist Chris Steenbergen, we offer you a collectible piece of future antique jewellery. The brilliance of the 0.75crt. old European cut diamond in a mille grain setting looms magnificently out of the black cabochon onyx with the outlines of an emerald cut. Although this jewel from the 1960's is composed in a sober shape, still any frill would have been an injustice to the Art Deco period. 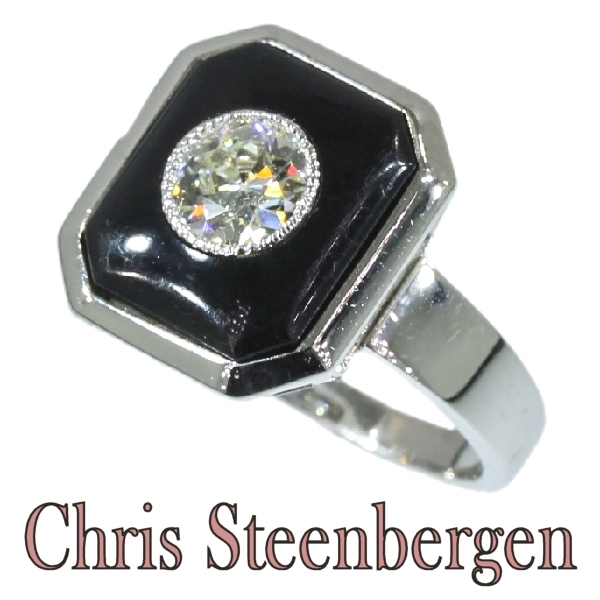 Extra information about the jewellery artist Christiaan Frederik (Chris) Steenbergen: Chris Steenbergen is one of a few well know Dutch artist jewelers in the second half of the 20th Century. This jewel was part of a private collection which we were lucky enough to be able to purchase. Ever since then we have been searching and studying into his background information to see where his jewelry was exposed and in what books he was mentioned. And it has been an interesting time. Steenbergen completed his training goldsmithing during World War II at the Institute of Applied Art in Amsterdam (IvKNO), currently know as the Rietveld Academy. In 1946 he got his master sign: 7CS. As an independent jeweler he lived and worked at the Leliegracht in Amsterdam. After graduating he worked briefly with other well known jewelry designers Archibald Dumbar and Esther Swart-Hudig. Steenbergen took part in national and international exhibitions. On the occasion of his 65th birthday a retrospective took place in Museum Boijmans - Van Beuningen in Rotterdam. He received the award by the Foundation for Visual Arts, Design and Architecture in 2000 for his complete ouvre. As a member of the Society of Cooperating Craft Artists (GSA) he exhibited his jewelry regularly. Characteristic of Steenbergen's jewelery designs are sleek and simple shapes that arise from some basic shapes like the square, the circle and the ellipse. In combination with gold and silver Steenbergen sometimes processed other materials such as colored perspex, ebonite, rock crystal and slate. The developments in the visual arts was a source of his inspiration. Bauhaus, the sculptures by artists such as Henry Moore and Antoine Pevsner and abstract constructivism also influenced his designs. Later, architecture was a big source of inspiration to him. Extra information: Art Deco - The Art Deco style is a very famous and popular art movement that had a lot influence in the world of jewelry. Art Deco was introduced in the 1920s as protest against the Art Nouveau style. Art Deco ended in the 1930s. The style emphasized a very abstract design with geometric patterns and as most favorite colors: black (onyx), blue (sapphire), green (emerald), white (diamond) and red (coral). The baguette and emerald-cuts, which had been developed in the nineteenth century, where very popular in the 1920s because they blended so much with the geometrical lines of the Art Deco style. Most of the Art Deco jewelry has a very luxury design. This is because of the large amount of money that was made in the war of 1914. All this money gave the opportunity to buy the best fashionable materials like: diamonds, platinum, red gold and yellow gold for the design of the jewels. Of course there are a lot of beautiful but less priced jewels in the Art Deco movement. Years later in the 1960s and 1970s Art Deco came back as a very popular decorative art. Even nowadays you can see that Art Deco style has great influence on our designing in all kind of branches. After the Universal Exposition of 1900, various French artists formed a formal collective known as, La Société des artistes décorateurs (the society of the decorator artists). Founders included Hector Guimard, Eugène Grasset, Raoul Lachenal, Paul Follot, Maurice Dufrene, and Emile Decour. These artists heavily influenced the principles of Art Deco as a whole. This society's purpose wasto demonstrate French decorative art's leading position and evolution internationally. They organized the 1925 Exposition Internationale des Arts Décoratifs et Industriels Modernes (International Exposition of Modern Industrial and Decorative Art), which would feature French art and business interests. Russian artist Vadim Meller was awarded a gold medal for his scenic design there. Extra information: Chris Steenbergen (1920-2007) - A well known Dutch artist jeweller goldsmith silversmith. Participated in many exibitions in many countries and is mentioned in many books on contemporary jewelry art. A more extended explanation on his live and works are to be found on our Chris Steenbergen glossary page. Note: The diamond weight, color grade and clarity are approximate since the stone was not removed from its mount to preserve the integrity of the setting. Total diamond weight: approx. 0.75 crt. Birthstones: Diamond is the birthstone (or month stone) for April and onyx for July. Hallmarks: The Dutch control mark representing an oak leaf that is in use since 1953.